Many horses enjoy snacking on carrots and apples. If your horse is reluctant to eat its favorite treats, it may be suffering from a dental disease called Equine Odontoclastic Tooth Resorption and Hypercementosis (EOTRH). 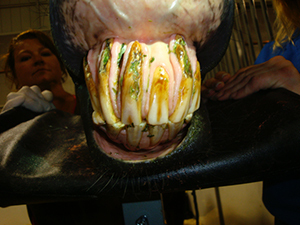 This disease occurs in older horses and most commonly affects the incisors, which are the front teeth that horses use to grab carrots and apples. The disease process also can affect the horse’s canine and cheek teeth. Picture of front teeth of a horse with EOTRH. Signs that your horse may have EOTRH include reluctance to grab treats or food with incisors, bad breath, receding and inflamed gums, head shaking, drooling, weight loss, sensitivity to manipulating the head, occasional inappetence, draining pus around the teeth and enlargement of the tooth roots that may look like swollen gums. Currently the cause of EOTRH is unknown. Since the condition is seen most commonly in older horses, it is important for geriatric horses to have regular dental exams. X-ray of a horse’s front teeth with EOTRH on second tooth from the right. EOTRH is potentially an incredibly painful condition, which is why your horse may be hesitant to grab its favorite treats. If you suspect your horse is affected, it is best to have your veterinarian perform a complete oral examination of your horse. Your veterinarian will sedate the horse and take X-rays of the teeth to look for signs of EOTRH around the roots of the teeth. 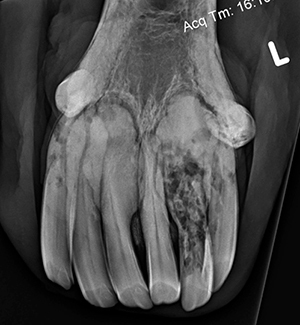 Incisor X-rays are the gold standard for diagnosing EOTRH. 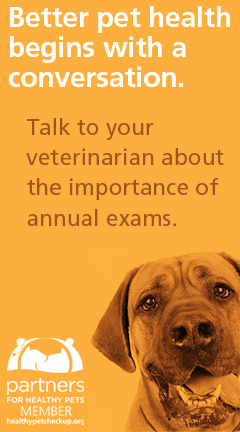 Your veterinarian also can check for other dental problems that may cause pain or difficulty eating. There are no medications that will cure EOTRH. Your veterinarian will identify the affected teeth and extract them to greatly improve the horse’s comfort. This can be done as a standing procedure with your horse under heavy sedation. Your veterinarian will use local anesthetics to numb the nerves to the teeth that are being extracted. In some instances, general anesthesia is required to successfully perform these extractions. Once the teeth are extracted, your veterinarian will suture your horse’s gums over the extraction sites. Your horse will also receive pain medication both during and post surgery. Once identified and the affected teeth are extracted, horses with EOTRH usually do well. The mouth heals quickly because it has an excellent blood supply and your horse will feel much better without pain. After the mouth is healed, your horse should be able to eat carrots and apples again. Depending on how many teeth need to be removed, you may have to cut the treats into small pieces. 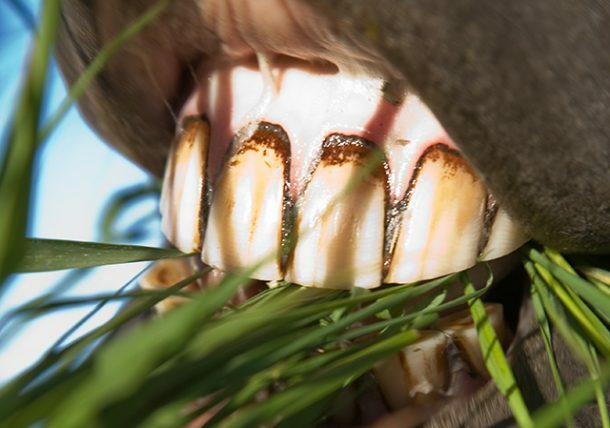 Even horses that need all of their front teeth removed often can continue their normal jobs and even graze. You may have to make some feeding adjustments for your horse, such as soaking a high-quality feed. This softens the foods, making it easy for your horse to eat. Kathleen Morriss, DVM, is a graduate of Auburn University College of Veterinary Medicine. 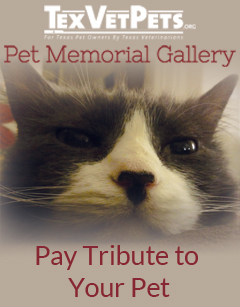 She lives in Uvalde, Texas, and practices at Southwest Texas Veterinary Medical Center.